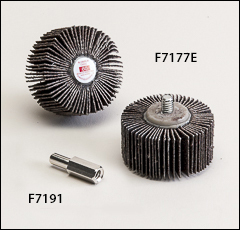 Flap wheels, mounted flap wheels, flap wheels with shank, flap wheels with threaded shank, abrasive flap wheels. Additional options include mini wheels or unmounted wheels with four different bushing reducer options. SAFETY WARNING: Make sure the maximum RPM of the wheel you choose below, is more than the RPM of the power tool you are using. RPM of power tool cannot exceed (must be less than) maximum RPM of these items. WARNING: Proposition 65 Label for all flap wheels shown below. Aluminum oxide, resin bond, X-weight cloth, and a 1/4" smooth shank. Excellent for use in small narrow curves, tubes, cavities, and other concave or convex shapes. 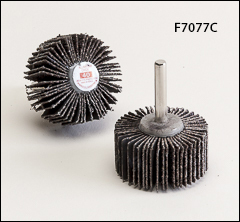 Ideal for blending and polishing metal, plastic, and wood. Larger wheels are used for stock removal and shaping. Many additional sizes and grits are available. Sold by the pack, 10/pack. The male threads and flange are an integral part of the wheel. Flap wheel spins on and off the F7191 adapter, without using tools. This allows for faster change of flap wheels on air tools. threads onto the 1/4"-20 threaded shank of the flap wheels listed above. Sold in any quantity.